Edwulf was a shock winner a most dramatic race today as the J P McManus owned gelding gave trainer Joseph O'Brien and jockey Derek O'Connor their first Grade 1 winners over steeplechase fences. Edwulf's 'f1pp-' form-figures coming into today's Grade 1 showpiece told only half the remarkable gelding's story, as the son of Kayf Tara was also at death's door having collapsed at Cheltenham last March. Today's race featured most of Ireland's best staying chasers and while last season's Irish National winner Our Duke blundered away his chances at the second last fence, Killultagh Vic held the lead jumping the final fence. However, Killultagh Vic crashed out at that fence leaving Edwulf, who had crept into contention under a trade-marked patient Derek O'Connor ride, and Outlander to fight out the finish on the run-in. Edwulf, a one-time notoriously bad jumper, pulled out more on the run-in to score a thoroughly unlikely neck win. An understandably chuffed trainer O'Brien later reported “he (Edwulf) ran out of oxygen and basically collapsed and fainted and was on the ground for the guts of half an hour. The vets were always confident he'd be fine though, as it was basically exhaustion as the race was over an extreme distance and he made a mistake which knocked the stuffing out of him. “All the vets did such a good job with him and everyone at Martinstown did so well too. He came back to us and I can't quite believe it! It's been a long road for him. “He pulled up here at Christmas when Derek said he just got tired with him although he gave him a nice feel and just blew up. He thought he'd improve for the race and he was right! “Derek is an unbelievable horseman and gets on great with this fellow. “I suppose we'll think about the Gold Cup now but we'll see how he comes out of this. It's not too often you get a horse good enough to run in a Gold Cup so we'll think about Cheltenham if he comes out of this race well. Winning owner McManus, winning the famous race for the fourth time, added “we had thought about possibly leaving him live out his days in retirement at Martinstown but everyone has done a marvelous job getting him back to today. “Joseph wanted to run him here and did said before today 'don't be surprised if he runs a big race'. “He gave him the perfect ride and I think Derek is as good as any of the professionals — I'd take him any day. “I know it's not good for the punters but I'm delighted that everybody connected with the horse and I'm very excited. 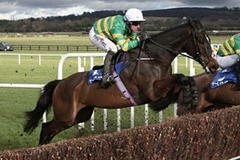 Jockey Derek O'Connor added “the race went picture-perfect and he was travelling beautifully and gave me a great feel. I wasn’t sure what I had left at the third last but then he just came alive. “We thought he would never race again after Cheltenham last year but Mr McManus, John Halley, Ger Kelly and all the veterinary team and Joseph have nursed him back. “He got back for a nice run here at Christmas and he’s after improving no end since. Today is a fairytale and that’s a fairytale horse. He has tremendous heart and just doesn’t know when he is beaten. He’s as tough as nails. Robbie Power, jockey of Our Duke, said “I’m absolutely delighted with him; Down Royal was a non-event for him and realistically it was a first run of the season. He was very ring rusty and will improve an awful lot from it.